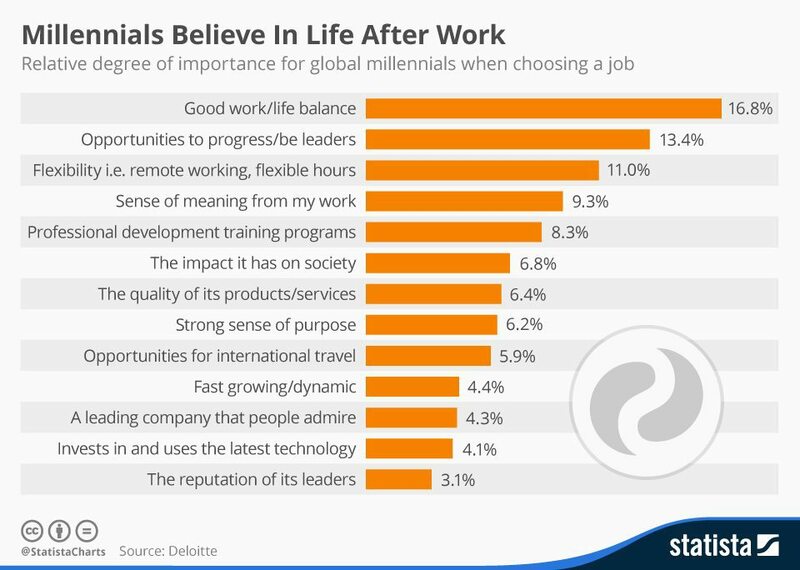 Statista released an infographic about millennial workers based on a study done by Deloitte. According to the study, millennial workers are skeptical of traditional company structures since increasing profit seems to the only goal. Companies that attract and retain millennials provide great work-life balance, opportunities to progress and flexible work hours. When it comes to millennials, it seems like most of the conversation in real estate surrounds how to attract and keep younger clients through snazzy marketing, social media targeting and other tech tools. But how can brokerages attract and keep would-be millennial agents? A new infographic from Statista based on a study from Deloitte may reveal the keys. What’s the best way to attract and retain #millennial workers? According to Deloitte’s study, millennial workers are disenchanted with the traditional corporate structure and often believe companies have nothing else in mind other than increasing their bottom line. Companies that successfully keep millennial workers provide a healthy work-life balance, opportunities to progress or be leaders and allow flexible working hours.